“The goal of the #LoveIsLove campaign is to unite all people, regardless of who they are or who they love, to support love equality” says Zach Gallant, President of the Mount St. Vincent University Students’ Union. However, to Zach Gallant, President of the Mount St. Vincent University Students’ Union, love stirs up much more emotion than a catchy 90’s dance tune could ever hope. In the winter of 2013 Gallant initiated a campaign known as Love is Love to bring love into the spotlight for Mount St. Vincent University students and get students to think about who they love and what it means to love, and perhaps most importantly, to consider love equality. “The goal of the #LoveIsLove campaign is to unite all people, regardless of who they are or who they love, to support love equality,” says Gallant. With Valentine’s Day around the corner it certainly seems an appropriate time to get people asking themselves these questions. “This campaign is intended to strengthen the voice of the allies,” says Gallant, who believes that by creating a public campaign those who would otherwise remain silent have an easier time speaking up and supporting love equality. “Love is something that is so natural that we often take it for granted. The love for our parents, our friends, our partners, all the people who love us unconditionally, to take the time to think about this... shows that you’re appreciating those who have given love to you,” explains Gallant. The campaign is entering its second run this year and hopes to grow beyond the university campus. “Our theme this year is 1000 Strong, as we invite 1000 people from across Canada, whether they are students, staff, faculty, community members, or even celebrities,” says Gallant. 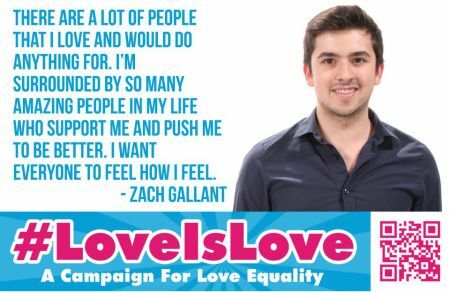 Gallant presented the Love is Love campaign at the Canadian Organization of Campus Activities (COCA) conference this summer and universities such as St. Mary’s and Algonquin College have also decided to participate in the campaign as a result. Love is Love aims to get people talking about love equality and by creating discussions hopes to foster more acceptance and awareness about equality. “We have always made the focus to be about love equality because we feel that it’s something that everyone can stand behind. How can someone be against love?” says Gallant. All are welcome to follow and share the campaign via twitter hashtag #LoveIsLove.